This study was based on data analysis of 82,119 UVU/UVSC student records. 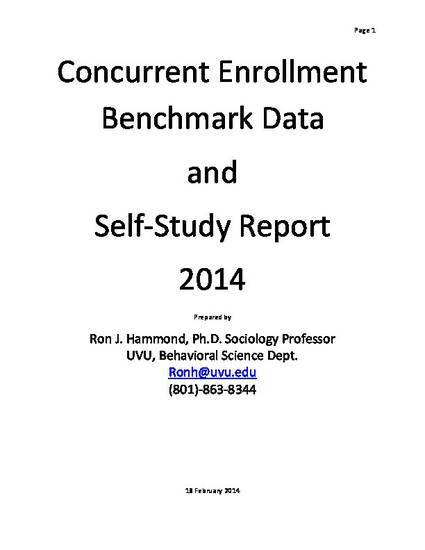 An IRB application “Secondary Analysis of UVU’s Concurrent Enrollment Data” was submitted on 12 July 2013 and approved (approval #01096) on 18 July 2013. The main purpose of the research was to provide benchmark data and a self-study report thereby establishing informed strategies to improve UVU’s overall Concurrent Enrollment Department and student success. The analyses presented below are post-hoc and descriptive utilizing a minimum threshold of .05 levels of statistical significance. Outcomes were measured for the following four categories of students: Concurrent Enrollment (CE), Advanced Placement (AP), Distance Ed. (DE), and On-Campus (OC) students. Multiple Comparisons of mean scores indicated that the AP students graduated more: Associate, bachelors, and doctoral degrees while OC student graduated with more Masters Degrees.